– Annie Smith Peck, quoted in The New York Times, June 3, 1911. 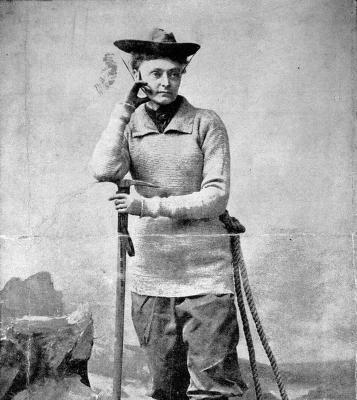 Annie Smith Peck was a leading mountaineer, archaeologist, suffragist and founding member of the American Alpine Club. Born in 1850 in Providence, Peck had hoped to pursue the same course as her older brothers, entering into academia through the hallowed halls of Brown University. Brown’s doors were firmly closed to women at this time, an inequality that affected Peck deeply. Unrelenting, she forged another path, moving to Michigan to teach, and enrolling to study Classics at The University of Michigan when she was 27. She lectured widely, proving her worth as a scholar, moving to Europe to further her education in Hannover and Athens, and becoming the first woman to be admitted to the American School of Classical Studies at Athens. In the mountain ranges of Europe, Annie Smith Peck found her second passion. She began scaling peaks in the Alps and Dolomites in the late 1800s, culminating in a successful ascent of the Matterhorn in 1895. It was widely reported in the press that Peck had worn trousers, for her climb, prompting public debate about the practicalities of female dress, and more widely, what was acceptable behaviour and activity for women. In the early 1900’s she openly competed with contemporary mountaineer, Fanny Bullock Workman, for altitude world records in South America. She closely missed out on the accolade, but this very public display of competitive physical endurance, confirmed the capabilities and determination of female athletes and explorers to the American newspaper readership. She climbed her last mountain at the age of 82. Peck’s ability to provoke discussion marks her as a uniquely radical figure in the fight for women’s rights. She confronted the inequalities she faced head-on, in both actions and words, exploiting her position in the public eye to challenge convention and promote the causes she believed so strongly in. Most famously, in 1911, at the age of 61, Peck raised a ‘Votes for Women’ banner on the Peruvian Peak of Mount Coropuna. An astute media manoeuvre that brought the attention of the world’s press to both the cause of women’s suffrage, and her own physical achievements, dispelling the arguments of the anti-suffragists in one fell swoop. Annie Smith Peck was a media darling in her day, her legacy forgotten, and rediscovered again more recently. Her exclamation ‘don’t call me a woman mountain climber’ rings as true today as it did 107 years ago, and in 2018 women still struggle to be recognised, distinct of their gender, for their amazing feats of physical endurance and strength. Annie Smith Peck was a pioneering mountaineer, an accomplished scholar and a successful writer, and we should, as she remarked, ‘let it go at that’.